Hollywood2020.blogs.com blogger Joyce Schwarz just spent two days watching SLIPSTREAM -- Anthony Hopkins new indy film that somehow went directly to DVD. Two days-- yes, I'll explain later -- right now I'm left with my own slipstream of images. YOU MUST SEE THIS MOVIE. THE MOVIE IS GOING TO BE FEATURED IN MY NEW BOOK--- more on that later. js. 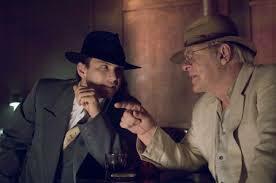 excerpt from pix on cover of SLIPSTREAM DVD -- indy film by Anthony Hopkins -- stunning -- visually amazing! ...not just the cover believe me js. Image may be scaled down and subject to copyright. A CHRISTMAS STORY....is a story of spin-offs this holiday season...by Joyce Schwarz, blogging at www.hollywood2020.blogs.com. Is it Sacrilege or is it Satisfying to see these spin-offs....according to notes and comments on Youtube.com and reception from the press...the crowd seems to be giving more kudos than pans to these commercializations of the 1983 film. NOTE....we at Hollywood2020.blogs.com would never trust that all of the comments at Youtube.com are real-- we think that they are reel too...made up by the ad agencies and fans of the video that is being promo'd...but who knows? It's all virtual online isn't it? See our previous blogs about the film, trivia and the restoration of the house that was used as the outside view in filming in Cleveland, Ohio --on the mythical "CLEVELAND STREET". A big reason for the popularity of A CHRISTMAS STORY is the annual marathon showing by the TBS cable network, which starts each Christmas Eve; in 24 hours, the movie is shown a dozen times in a row. THE NEW YORK TIMES describes Cingular's new commercial by saying: Cingular Wireless by the Atlanta office of BBDO Worldwide, part of the Omnicom Group, recreates the central narrative of the film in 30 seconds, replacing the BB gun that Ralphie desires with a cellphone. Adults in the movie insist to Ralphie “You’ll shoot your eye out.” In the commercial, the refrain becomes, “You’ll run the bill up.” A happy ending ensues when Ralphie’s parents buy him a prepaid Cingular cellphone, the GoPhone. POP CULTURE AND ADVERTISING...advertising and entertainment -- winning duos? Truly, the commercials and other ads featuring A CHRISTMAS STORY...show how advertising and pop culture are intertwined or maybe even how advertising and entertainment are increasingly complementary -- and one steals from another-- or licenses as it may be, because of course Cingular did have the permissions from Time Warner. Trends in popular culture...some blame it to the dumbing down of society....of the cult followings of a few...or of fads...popular culture is but one window to our world...But it sure provides plenty of talk around the water fountain (if one still exists at your company) or in our time the fodder for viral videos. "No! No! 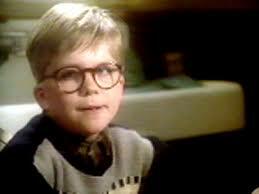 I want an Official Red Ryder Carbine-Action Two-Hundred-Shot Range Model Air Rifle. " PAPER VS ELECTRONIC HOLIDAY CARDS -- SHUTTERFLY DVD MAYBE BEST? Hi, did you know people are still sending holiday/Christmas cards -- paper ones that is! by Joyce Schwarz, blogging at www.hollywood2020blogs.com. Do you or don't you send a paper card out. It's such a wonderful tradition. To get that thing called a p-e-n in hand and actually write something personal. BUT THERE ARE SO MANY OPTIONS...and will I be the only nerd who actually sends out cards when my fellow electronic media pals will be sending cards that sing, squawk and dance online? Click on thumbnail to preview our JCOM, www.joycecom.com holiday card. We made it at Shutterfly.com and could not be happier. We identify the collage of pix inside and also got a chance to show off our favorite pix of the year.PS could not be happier with the service at Shutterfly. USA TODAY has an article WHAT'S IN THE CARDS on this that answers some of these questions -- and it hit the wires just 33 minutes ago....Americans will send nearly 2 billion cards this Christmas, according to Hallmark, the leading greeting card company. According to American Greetings, the No. 2 greeting card company, three-quarters of card consumers will buy multiple styles of cards, whether they're purchasing cards individually or by the box. WHO BUYS CARDS? Women buy more than 90% of all holiday cards, and they tell us they buy three kinds: Religious themes they send to someone who appreciates it. Humorous cards they send to a close girlfriend or someone whose sense of humor they know well. And the more general 'Season's greetings' kind they send to professional associates or people who celebrate both Christmas and other religious holidays," Angela Thompson, a manager at American Greetings told USA TODAY.. Even e-mailers send multiple styles of cards according to the USA TODAY ARTICLE....they mention Jamie Shaw, who lives in Utah and Rio de Janeiro, says she couldn't keep track of all her friends' addresses to send each a physical card. "Now I create my own custom electronic cards each year," with different e-cards for different recipients. At Hollywood2020 we checked out the electronic cards from our American Greetings subscription and saw a gingerbread man/girl who talks-- our pals online can watch for a version of that to come around with a special customized greeting in Joyce Schwarz voice. Very kewl card....more on that later. SHUTTERFLY DVD - - check out this Shutterfly.com DVD option -- it is amazing and offers all kinds of editing options/wipes, dissolves etc and even needledrop music to go with your card/DVD. It is truly amazing-- now if we only had the time to take some of our 100 favorite pix and import them to Shutterfly and make that DVD...well, New Year's isn't far off or maybe for Valentine's Day?? WORLD TRADE CENTER: JESUS AND A WATER BOTTLE? FX? The film is capturing mostly positive reviews from NY TIMES and other publications EW review: An honorable 'World Trade Center'-- most especially Christian pubs The Presence of God in World Trade Center who are giving tribute to the strong "GOD emphasis" of the film.Movie Ministry A surprise for this viewer who had not heard about the "JESUS AND THE WATER BOTTLE" scene prior to seeing it. At first glance it seems over-the-top, maybe better imagined than envisioned -- especially the bleeding heart on the Jesus vision...Yes, I know the vision is a true one but not the heart. according to Stone and other sources. Stone hailed for therapeutic "World Trade Center"
ON LOCATION IN BONNE BAY, NEWFOUNDLAND...at the Bonne Bay Marine Station with Dr. Robert Hooper, Director. . .back to the time of Captain Cook's explorations in Atlantic Canada and flash forward to underwater exploration on land...it was quite a visit for the Earth to Human (www.earthtohuman.com) Eco trip participants as they saw the next wave of oceanography today with a behind-the-scenes tour and talk by Dr. Hooper and demo of technology by Steve String in the Marine Station tech lab. On location at the Bonne Bay, Newfoundland Marine Station -- exploring the 'next wave' of Oceanography with a lecture by Dr. Robert Hooper, Director Bonne Bay Marine Station. hmmm which way do fish swim -- click on thumbnail JPEG from the Bonne Bay Marine Stationo in Newfoundland-- there are many ways to view the wonders of the sea. Earth To Human is a luxury adventure/journey through the beauty of Gros Morne Naitonal Park and the Great Northen Peninsula of Newfoundland. The trip is part of the exploratory series of Horizon & Co. , a Canadian boutique travel bureau. Cultural and eco programming elements were woven into the weeklong experience. The adventure was organized with the cooperation of Parks Canada and is the brainchild of David Maggs, who is also the Artistic Director of the Gros Morne Music festival. For more details go to www.earthtohuman.com or check out other adventures at www.horizon-co.com, or email me at [email protected]. If you're a faithful reader of this blog you know that Joyce Schwarz is along for the eco-experience primarily to explore the impact that the outdoors has on future entertainment development/creation and to see what steps can be taken to conquer the mass epidemic of Videophilia where more kids in the USA are using their Xbox than their sandbox -- a phenom explored by a recent study by the US National Park Service. Watch for more on Videophilia and what Dr. Michael Newton, Memorial University of Newfoundland has talked about in his eco-psychology presentation about Biophilia! ONE RED PAPERCLIP DUDE GETS HOUSE -- BUT WILL HE BARTER HIS OWN MOVIE RIGHTS? By Joyce Schwarz, JCOM, emerging entertainment consultant, www.joycecom.com. ONE RED PAPERCLIP is quite a story...if you don't know what I'm talking about go to www.oneredpaperclip.blogspot.com and you'll see. Or check out the news. Joyce Schwarz, blogger at Hollywood2020.blogs.com thinks it's quite a story- in fact she's got an email into the dude right now about optioning his life rights for a theatrical film ...and also the rights for a reality show-- TRADING UP?? and maybe even VC funding for his RED PAPERCLIP TRADING POST. Anyway....Hollywood2020 is heading to Montreal on other business-- so we'll look up the Paperclip Dude and see if he's still in a trading frame of mind! We're going to bring our ITEX (barter association) checks with us...and a pen! Meanwhile for more info, email us at [email protected]! (Blogger note-- don't miss Corbin on the new TV series PSYCHED starting July 7 (last Friday)on USA Network.